This site is all about personal communication. There is a real sense that you can sign up and dive straight in to have fun. So there are plenty of opportunities to contact other users, from private message to instant chat, “flirts” and “winks” plus plenty of webcam action. There is even the opportunity to upload a voice introduction. You can also get to know other users by participating in the huge selection of active chat groups, which cover a whole range of dating issues and more. Even when you aren’t talking to another user, you are encouraged to interact. For example, the “Hot or Not” feature lets you review profile pictures and give them either a thumbs up or a thumbs down. Conveniently, the “What’s Hot” section is a great place to browse the most popular videos, pictures and profiles. In addition to all of that, there is a blog and magazine to help keep you entertained. Getting started at AdultFriendFinder.com is extremely straightforward. You will be asked for some very basic initial information, including gender and location. Another window will then ask you for your e-mail address, username and password. You will also be prompted for an introductory tagline and a small self-description. This is a great opportunity to catch someone’s eye. And if you are struggling to talk about yourself, there are some useful standard responses provided which you can choose from. Finally, simply complete the captcha code and get started. The captcha code is a useful feature to guard against scammers. But, Adultfriendfinder has plenty of other safety tools too. For a start, you can mail and chat to other users anonymously. Also, all new profiles are screened and if you come across a problematic user, you can block them from contacting you again. Finally, for an extra fee, the “Confirm ID” and “Private Call” features also help ensure privacy and safety. Free members can’t initiate contact with other users, but they can participate in the chat room action and have limited instant message conversations. However, if you really want to get the most out of Adultfriendfinder and start having fun right away, then you will need to pay for membership. 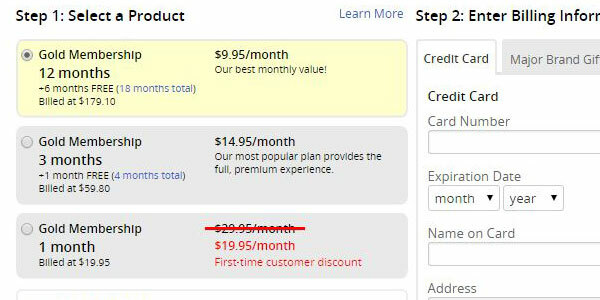 A single month will cost $19.95, while a 3-month deal costs $59.80 and a 12-month package is priced at $179.10. Every AdultFriendFinder review will tell you that there are plenty of features to keep you busy and a huge number of photos and videos. Yet, what they often overlook if that the interface is clean and uncomplicated. So, directly from your personal dashboard you are able to access your inbox, the chat rooms, blog and magazine. Meanwhile, there is a sidebar which links directly to useful features, such as the hotlists where you can keep track of your favorite profiles and you can see who has interacted with you. Adult Friend Finder also has a mobile app, so you can stay in touch with all the action wherever you are. Conveniently, you can also request SMS notifications too. You will automatically be presented with regular matches. In fact, each time you log in, you will be able to review suggested compatible users. However, if you want to take matters into your own hands, then the search engine provides two options. A basic search will allow you to find someone via broad criteria, such as gender and sexual orientation. However, the advanced search lets you be far more specific. You can highlight particular lifestyle habits or physical attributes which are important to you. Usefully, you can also search by who is online now or by a particular keyword. AdultFriendFinder.com offers many methods to get in touch with and interact with other users that you cannot fail to feel engaged and entertained. However, it is important to note that this is a top quality site for casual fun, rather than finding the love of your life. If you are looking for a serious relationship, then read our review of EliteSingles.com. Adultfriendfinder though is perfect platform for active singles looking to flirt and have fun.